There are many models for doing fine work. One approach is to clarify the real results you want to achieve in a situation. 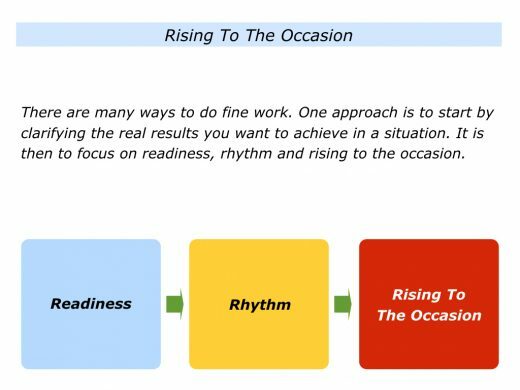 It is then to focus on readiness, rhythm and rising to the occasion. Imagine that you want to follow these steps in your own way. The first step is to choose the specific situation in which you want to rise to the occasion. You may want to do this when encouraging a person, playing a sport or running a mentoring session. You may want to do it when managing a crisis, leading a team, doing a creative project, performing a brain operation or doing some other activity. If possible, choose to focus on an activity in which you feel in your element – at ease and yet able to excel. It can be useful to focus on one that you find stimulating and where you have a good chance of achieving success. Some people I have worked with in the past – such as performers and sports people – preferred to use the word arena rather than situation. They chose the word arena deliberately. It had elements of being on-stage and delivering the goods when it mattered. This final point was important. Some sports players were good on the training field, for example, but had difficulty in more competitive situations. The people I worked with wanted to go into their chosen arena and perform at their best when under pressure. Imagine that you have chosen to focus on a specific situation in which you want to rise to the occasion. You can then clarify the real results you want to achieve, but this comes with an important proviso. It is vital to focus on what you can control in the situation rather than what you can’t control. You can then translate what you can control into a clear picture of success. A great athlete, for example, recognises that they can control their attitude, preparation and performance. They can’t control the weather, the other competitors or poor judgements by officials. The real result they aim to achieve is to do their best on the day. 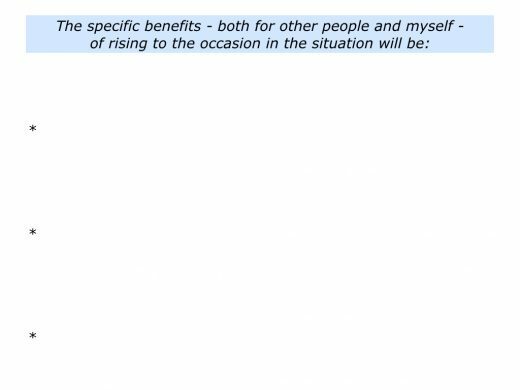 Describe a specific situation in which you want to rise to the occasions. 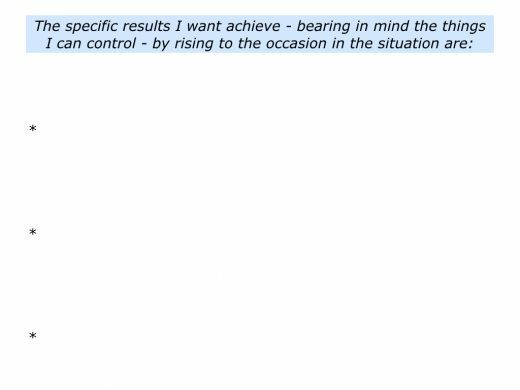 Describe the specific results you want to achieve – bearing in mind what you can control – in the situation. Describe the specific benefits – both for other people and yourself – of rising to the occasion in the situation. Peak performers in sports, for example, prepare properly before their event. Going into the arena, they switch into action mode and apply themselves fully to perform at their best. Imagine that you want to follow this approach in your own way. It can be useful to focus on the following steps. You can make sure that you are physically, practically and psychologically ready. How to prepare properly? One approach is to get enough rest, eat the right food and feel physically ready to tackle the challenge. You can then move on to the practical and psychological aspects involved in aiming to do your best. To clarify the key strategies you can follow to give yourself the greatest chance of success. To rehearse pursuing the key strategies you can follow to achieve the picture of success. To anticipate and rehearse managing any difficulties you may meet on the road towards achieving the picture of success. To clarify the specific action plans you can follow towards achieving the picture of success. 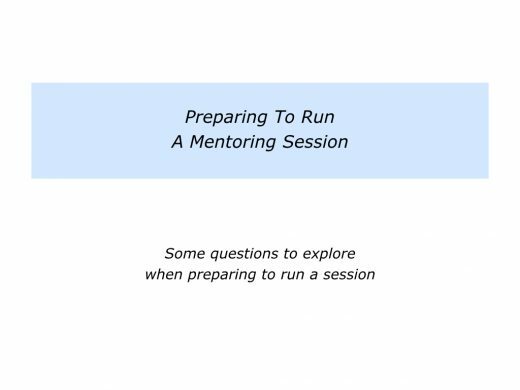 Looking at my own work as a mentor, for example, I follow these steps before every session. 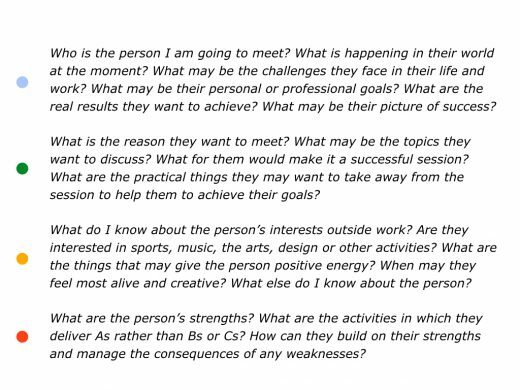 Below are some of the questions I explore before meeting the person. Let’s return to the situation where you want to rise to the occasion. You will have your own framework for preparing to perform at your best. 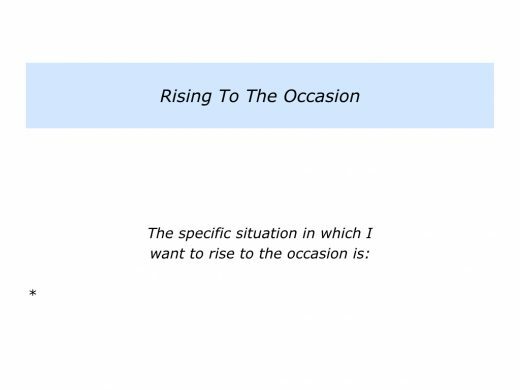 Describe a specific situation in which you want to rise to the occasion. Describe the specific things you can do to prepare properly and be ready to go into the situation. Preparation is crucial. I then have a ritual for clicking into action and hitting the ground running. My best performances have come from being able to get into my rhythm. I have then been able to deliver the required results. Sometimes I have been distracted but, after some effort, I have been able to recover. On other occasions, however, it has been difficult to get back into my rhythm and the results have suffered. If you are a creative artist, for example, you may have a certain ritual for clicking into action. You may work for a set time and then take break. You may go for a walk or do something else before returning to the work. Several business leaders I work with have established a different kind of rhythm. One leader for the European arm of a global business explained this in the following way. I prefer my lifestyle now, compared with when I headed the UK business. My working work has the following pattern. On Monday I take the children to school and then take a lunchtime flight to one of the major capitals. Monday night is spent having dinner with colleagues or clients. Tuesday, Wednesday and Thursday are devoted to clients visits. Sometimes this involves another flight on, for example, Wednesday night. The work is intensive, but it is also rewarding. I am able to play to my strengths, which is working directly with clients. Normally I fly back on Thursday evening and take the children to school on Friday. The rest of the day is spent working from home and finalising plans for the next week. This sounds tough, but it was harder when I ran the UK business, which meant travelling into London every day. My diary was full from the moment I entered the building. There were always crises to solve and meetings to attend. Sometimes I was lucky to get home before 8.00 pm at night. The lifestyle I have now is excellent. Sometimes I need to spend a week in the USA, but that is fine. I have also built a good leadership team who run the daily business. They release me to do what I do best, which is to work with customers and shape tomorrow’s business. Let’s return to the situation in which you want to do good work. How can you find and follow your chosen rhythm? 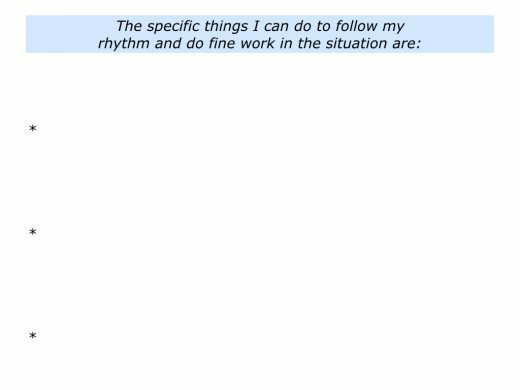 Describe the specific things you can do to follow your chosen rhythm and do fine work in the situation. Some people take that extra step to rise to the occasion. They keep doing the basics and then add the brilliance. Sometimes they reach their goals by adding that touch of class. Some people go into a state of flow. Absorbing themselves fully in the activity, they flow, focus and finish. Sometimes, as a by-product, they find fulfilment. One singer I worked with took this approach when performing at a concert. She described this in the following way. I had rehearsed in my room and in my mind for many weeks. Then came the day of the performance. Some people aim to become the best kind of singer, artist, person or professional they can be. 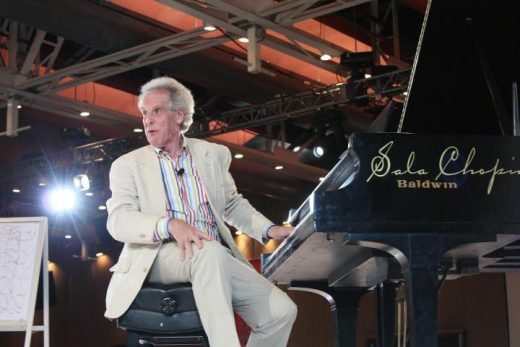 Benjamin Zander, musical director at the Boston Philharmonic, inspires people to take this step. He encourages people to work towards getting an A grade. Benjamin tutors hundreds of students from around the world who aim to pursue their musical studies in America. They are often financially supported by families who have saved to provide the funding. Benjamin greets the assembled students by describing how they can get an A Grade. He uses several versions of this story when giving speeches. Below is the one he used when I attended one of his talks. You can discover more about his work via the following link. First, write me a letter dated May next year – the end of your time here – headed My A Grade. Second, you and I will meet to discuss what you aim to do and whether these deserve an A. If not, we will agree on what you must do to get your desired grade. Third, it is then up to you to do the work and achieve the agreed grade. Imagine that you want to achieve an A grade in your chosen field. One approach is to keep doing the basics. It is then to make a habit of rising to the occasion. Looking back, can you think of a time when you have taken these steps? What did you do right then? How can you follow these principles – plus maybe add other skills – to perform brilliantly in the future? Describe the specific things you can do then to do your best to rise to the occasion.